This gives me a little chill, here to take over where my Winter in Indiana left off! Beautiful. I love snow clinging to the trees. Snow laying on trees like that is one of my all time favorite things. Lucky for me I woke up to a fresh coat of (wet) snow this morning, and we're looking at a big one for the weekend! Yes, I'm that person that really loves the snow! we got fresh snow last night and I have to get out with my camera. well, my camera and a shovel. it was a tree clinging snow too. So pretty, but bbbrrr!! I'm 'bout done with winter, I am. What is that white stuff on the tree? It snowed here this past weekend, but I missed it since I was at my parent's. I'm hoping that's it for us this winter. Beautiful picture. Lovely shot. Trees in winter are so picturesque, both when covered with snow or and when just bare and stark against the sky. I was taking pictures of the trees this morning also. While I'm not happy that Mr. P Phil said 6 more weeks of it; I am loving the snow falling... Just not a fan of it once it becomes yucky wet slush.. I don't get tired of the beauty of winter - not even when it snows in March. Oh! That is just ...! (I wanna run out and play with my camera right now, but it is just so cold and dark here). Nice pattern with branches and snow. It seems that snow is the theme for this week's WW. What a calming and pretty picture! Your pictures are always so beautiful. I wish I was as handy with a camera! Love the outlining of the branches. Great shot! My corner of the world looked just like that this morning! The evergreen was dotted with snow on the tip of its branches and a flurry of bright cardinals and blue jays decorated it while waiting their turn at the feeder. Well - actually - the blue jays don't really wait for a turn - they just bully their way on. But you get what I mean. Beautiful shot of the apple tree in winter. At least there's something to like about winter! Mmmm, mmmm, good. Love it. it is a very beautiful Pic! 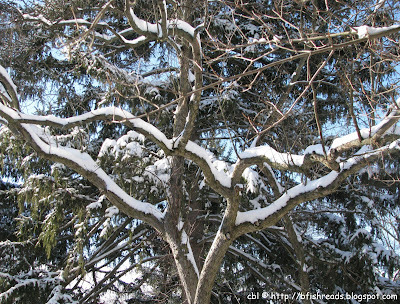 I love snow on branches pics! This is a good shot, Beth!